The all new PURE is Bummis's latest achievement! 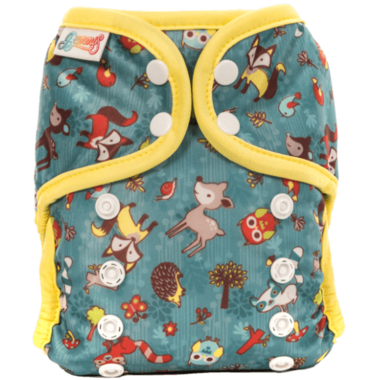 A super cute and reliable all-in-one diaper. No stuffing, no snapping in of inserts and no folding - simply adjust it to the size of your baby and snap it on. When soiled, remove and store in a FABULOUS WET BAG until you are ready to throw it into the washing machine. A beautifully TRIM diaper with incredible absorption, thanks to ultra-performing fabrics made to their specifications, that absorb rapidly and hold lots of liquid! Comfortable, secure fitting and stretchy elastic around baby’s legs. Solid snaps of extraordinary quality! 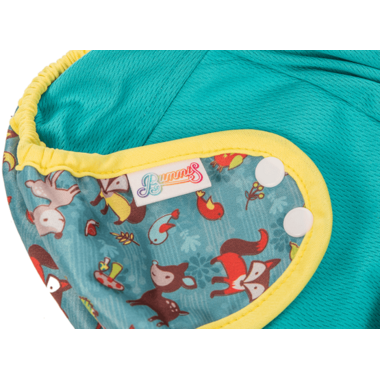 Allows you to choose whether to put natural fibers (bamboo viscose and organic cotton blend) or a stay-dry fabric against your baby’s delicate skin. The PURE is designed to shrink slightly during the first washes and create a natural gusset for a secure and leak proof fit.